For my last bake for baking along with GBBO the options were a meringue crown, a Victoria sandwich or a picnic for for a queen. 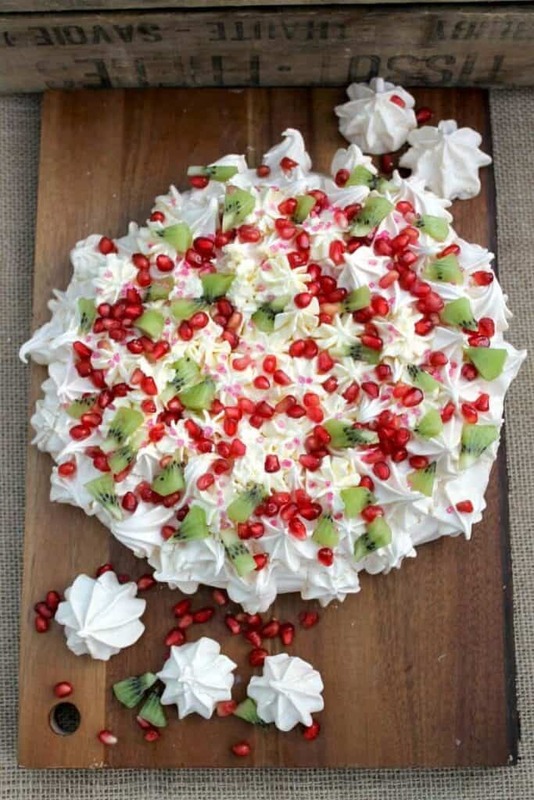 I decided on a pomegranate and kiwi crown pavlova. My idea was to decorate the crown with pomegranate seeds, which looks like a bit like jewels, perhaps glistening rubies, and kiwi pieces which add a contrasting colour as if they were another precious stone, perhaps Jade. My crown was a large meringue with detail piped around the edges. Three layers would have been a bit much for my family to get through I thought! Last time I made a large meringue for the blog it was a bit too crisp, this time I got it just right and it was marshmallowy in the centre just as I like it. 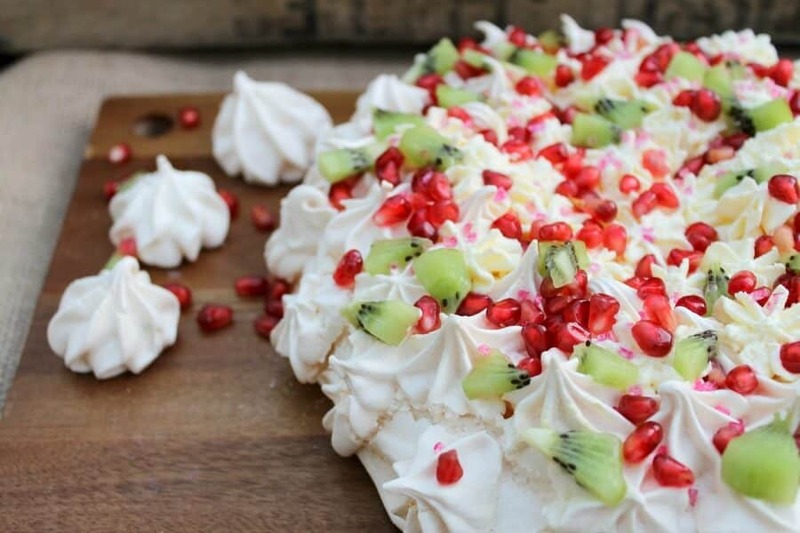 Paired with the sweet meringue, the tart flavour of the pomegranate and kiwi goes perfectly, cutting through the sweetness which can be a bit overwhelming otherwise. 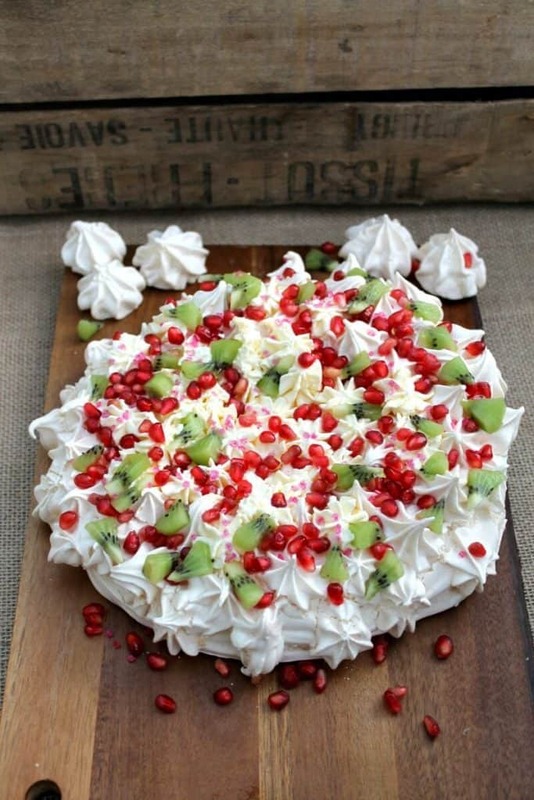 And of course we all know that whipped cream is the perfect partner for meringue in a pavlova. I love the pomegranate seeds which add a bit of sweet tartness as well as looking so pretty. 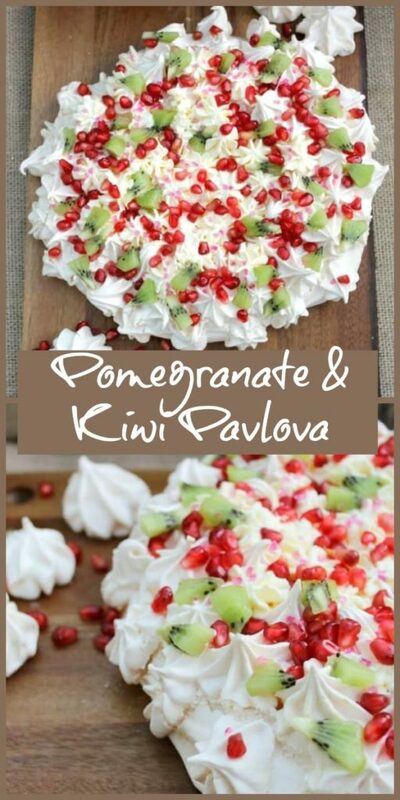 Why not pin my pomegranate and kiwi crown pavlova for later? Preheat your oven to 180 degrees fan. In a stand mixer, whisk the egg whites until they reach the soft peak stage. Add the caster sugar spoonful by sooonful, continuing to mix between additions, until all the sugar is added. Make sure you keep mixing for about a minute between each sooonful of caster sugar you add, so it gets properly incorporated and your meringue won't be grainy. Keep mixing until your meringue is glossary and smooth. Add the white wine vegetarian and cornflour and mix in. Using a spatula, sooon about two thirds of the meringue into a large lined baking tray and form a large circle. Make raised edges and a dip in the centre for the cream. Put the remaining meringue in a piping bag and pipe decorations around the edges of the pavlova. If you have any meringue left over pipe some meringue kisses onto the baking paper as well. Turn the oven down to 140 degrees. Place the baking tray in the centre of the oven. Remove the meringue kisses after about twenty five minutes. Leave the large meringue in the oven and bake it for 50 minutes to an hour in total. In my oven it was done after fifty minutes and remained soft in the centre. Turn the oven off and leave the meringue to cool inside. When cool, whip the double cream and pipe in the centre and add some decoration around the edge. Arrange the pomegranate seeds over the top. Slice the kiwi fruits, remove the skin, and cut each slice into small triangles. Arrange these over the top. I added a little extra decoration with some dark pink crystals. You could use whatever you have to hand to add some additional embellishment. Serve, and keep any leftovers in the fridge due to the fresh cream. My crown pavlova is of course being sent over to Jenny from Mummy Mishaps and the Great Bloggers Bake Off. It has been such fun baking along this year, it went by so quickly though. I wonder if the new series will inspire as many home bakers, but I guess time will tell. Oooooh I saw this on social media! It looks absolutely stunning. A real show stopper! I think I might try this at Christmas as a less rich alternative to Christmas pudding. The red and green is so festive! Stunning, Lucy, as ever! My two kids would inhale this. I liked Candice too, she was taking so many risks. 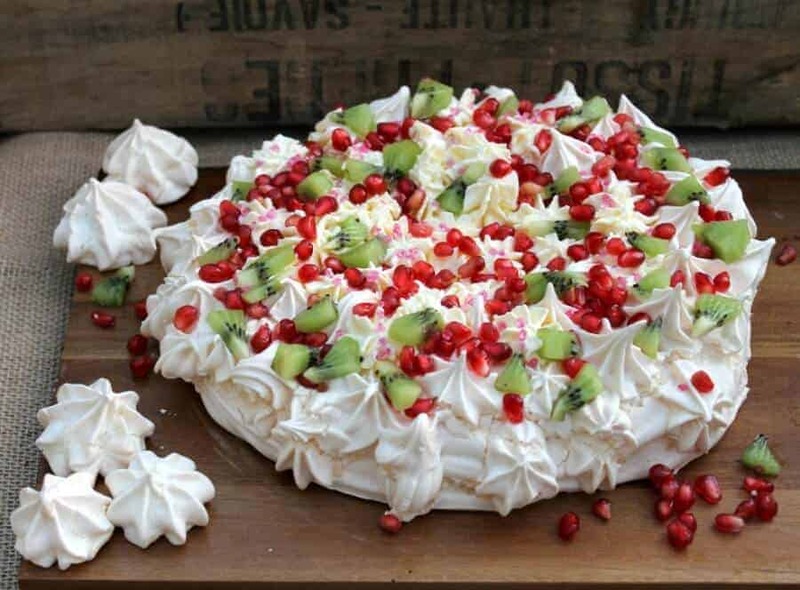 Your pavlova looks amazing, so colorful and pretty. This looks absolutely beautiful! My mum made us Mary’s Berrys Christmas Pavalova Crown to eat whilst watching the Bake Off final. So yummy! I think this pavlova looks so striking with the pomegranate and kiwi – Stunning. And of course I know that it will have tasted good, how could it not? it looks so pretty Lucy and i understand why you went with your jewell like pomegranate seeds (like me and those silver balls!). 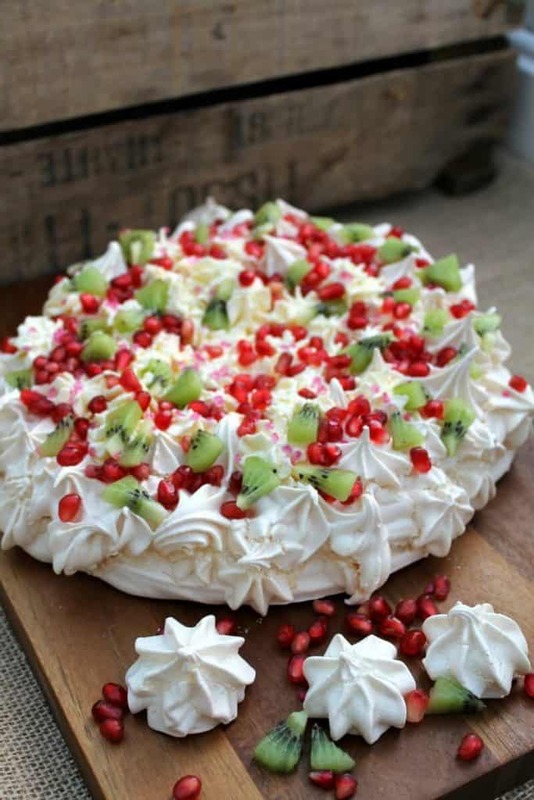 The meringue itself looks so pretty and the green kiwi adds a lovely colour to it with the red seeds. Very delicious too I am sure. I always think pomegranate seeds have a special jewel like quality to them. This looks stunning. That is absolutely gorgeous! Fit for a queen!